WASHINGTON -- Polling tracking the impact of the Republican convention has been sparse, but on Monday the Gallup Poll weighed in with a new survey showing the convention had only a "minimal impact" on the fortunes of Republican nominee Mitt Romney. 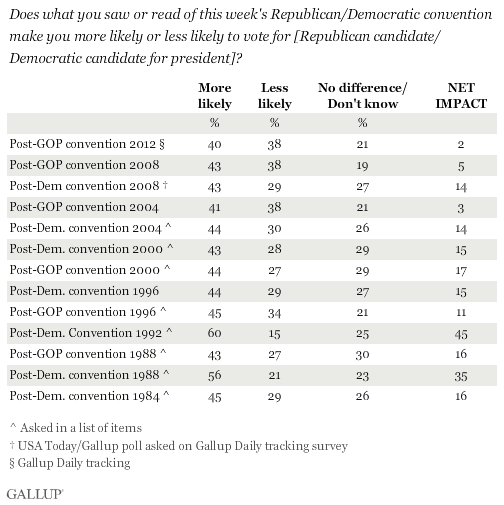 In interviews conducted over the three days since the close of the Republican convention, Gallup found roughly the same number of Americans saying the convention made them more likely to support Republican nominee Mitt Romney (40 percent) as saying it made them less likely to support him (38 percent). This self-reported measure should not be interpreted literally since, as Gallup points out, Republicans overwhelmingly said they were more likely to vote for Romney and Democrats largely said they would vote against him, as the partisans on both sides were already supporting their party's nominee. When compared to results from similar surveys conducted following conventions back to 1984, however, these questions provide what Gallup described as a "rough approximation of the conventions' relative impact," since they have asked the same questions following each convention. By that measure, the 2012 Republican convention had the lowest-ever self-reported net impact on voter intentions ever (+2, the difference between the more and less likely percentages), just slightly lower than the Republican conventions of 2004 (+3) and 2008 (+5). Gallup also found that just 38 percent gave Romney's convention speech an excellent or good rating, "the lowest rating of any of the eight speeches Gallup has tested since Bob Dole's GOP acceptance speech in 1996." Similarly, Gallup found that just over half of Americans (51 percent) said they watched at least some of the convention, "the second-lowest for any of the eight conventions Gallup has asked about going back to 1996." Only a handful of pollsters have attempted to track trends in support for Obama and Romney during the convention, and those surveys have so far produced mixed results. Gallup's Daily tracking survey has shown no movement at all over the last three days. Their latest release as of this writing, which still includes two days of interviews conducted just before the Republican convention began, shows Obama edging Romney by a single percentage point (47 percent to 46 percent). That result has not changed over the last five days of Gallup's tracking and is virtually unchanged from the prior seven days of interviewing conducted a week ago (which showed the candidates tied with 46 percent each). The Rasmussen Report's daily automated phone tracking purports to show Romney gaining ground, moving from a 2 percentage point deficit to a 4 point advantage over Obama (48 percent to 44 percent) among likely voters over the past week. However, Obama held a pre-convention advantage, which was an outlier from his previous showings in the Rasmussen tracking survey. Their most recent result is only a net 3 percentage points better for Romney than the average of Rasmussen surveys conducted in July and August, which showed Romney with 46 percent and Obama with 45 percent. Reuters and Ipsos have been conducting a daily tracking survey during the conventions that uses a new unproven Internet-based methodology. Their first wave of interviews conducted just before the Republican convention gave Obama a slight lead (46 percent to 42 percent), but their most recent interviews, conducted August 29 to September 2, shows a 45-to-45 percent tie. Taken together, the results from the three tracking surveys indicate a collectively closer race than the composite of all prior polls, as reflected in the HuffPost Pollster chart. However, the chart's current result is dominated by these three daily tracking polls, and two of those have consistently produced results that have been more favorable to Romney than other polls. All of this may turn out to be a momentary flutter in the data. As Professor Thomas Holbrook has shown, each party typically receives a bump from its convention, and the back-to-back timing of this year's conventions makes it much tougher to measure and interpret the shifts. Up until 2008, party conventions were held weeks or months apart, so pollsters were better able to examine each "bump" in isolation. Historically, the net impact of both conventions combined has produced large and sustained shifts in voter preferences, although the impact in recent years has been more modest. Watching the bouncing polling ball can be fun, but analysts will need to wait until mid-September to know whether this year's conventions have had a meaningful impact on the race.